Want to transfer your digital Data at the speed of light? Well now you can! 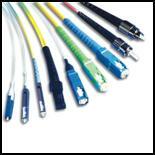 We can install or repair any Fiber Optics cable you may need. We have certified and experienced Fiber Optics installers who will get your fiber installed for you.